This recipe is the property of heatho72 and released under the CC Attribution-NonCommercial-Sharealike 4.0 license. You may not copy, derive or commercialize this recipe without following the terms of this license or the explicit permission of the creator. 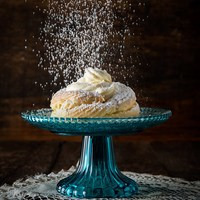 Definitely one of the better vanilla cream donut recipes out there, and definitely worth a second mix. Wonderful recipe, so tasty. Thanks for sharing! Already made 240ml and it's definitely in my rotation now.